The entire GIT is highly vascularized and therefore well perfused by the bloodstream. The splanchnic circulation, which perfuses the GIT, receives about 28% of cardiac output, and this flow drains into the portal vein and then goes to the liver prior to reaching the systemic circulation. An absorbed drug will first go to the liver, which is the primary site of drug metabolism in the body; the drug may be metabolized extensively prior to systemic distribution. This has been referred to as the hepatic "first-pass" effect, or presystemic hepatic elimination, and it has important implications in bioavailability and drug therapy. The fact that the GIT is so well perfused by the bloodstream permits efficient delivery of absorbed materials to the body. As a result of this rapid blood perfusion, the blood at the site of absorption represents a virtual sink for absorbed material. Under normal conditions, then, there is never a buildup in drug concentration in the blood at the site of absorption. Therefore, the concentration gradient will favor further unidirectional transfer of drug from the gut to the blood. Usually, then, blood flow is not an important consideration in drug absorption. Generally, the properties of the dosage form (especially dissolution rate) or the compound's inherent membrane permeability will be the limiting factors in absorption. There are circumstances, however, where blood flow to the GIT may influence drug absorption. Those compounds absorbed by active or specialized mechanisms require membrane participation in transport, which in turn depends on the expenditure of metabolic energy by intestinal cells. If blood flow and therefore oxygen delivery is reduced, there may be a reduction in absorption of those compounds. The rate-limiting step in the absorption of those compounds that readily penetrate the intestinal membrane (i.e., have a large permeability coefficient) may be the rate at which blood perfuses the intestine. However, absorption will be independent of blood flow for those compounds that are poorly permeable. Extensive studies have illustrated this concept in animals (113-115). The absorption rate of tritiated water, which is rapidly absorbed in the intestine, is dependent on intestinal blood flow; but a poorly absorbed compound, such as ribitol, penetrates the intestine at a rate independent of blood flow. In between these two extremes are a variety of intermediate compounds whose absorption rate is dependent on blood flow at low flow rates but independent of blood flow at higher flow rates. By altering blood flow to the intestine of the dog, as blood flow decreased the rate of sulfaethidole absorption also decreased. These relationships are illustrated in Figure 16. Figure 16 (A) Absorption rate constant of sulfaethidole in dogs as a function of mesenteric blood flow. (B) Absorption rate of several compounds in rats as a function of intestinal blood flow. Source: Part A based on data from Ref. 115 and part B based on data from Ref. 114.
example, it has been suggested that digoxin absorption is impaired in congestive heart failure but improves after compensation (118). The influence of such conditions on absorption has been reviewed elsewhere (119), but there is relatively little information available. 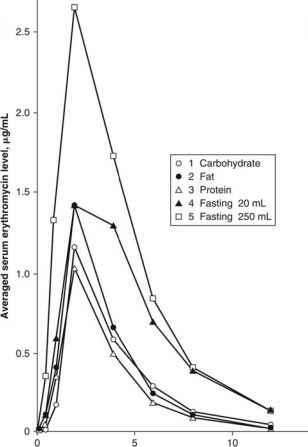 Blood flow to the GIT increases shortly after a meal and may last for several hours. Digestive processes in general seem to enhance blood flow to the tract. For reasons discussed previously, however, coadministration of a drug with a meal would normally not be expected to improve drug absorption on the basis of increased blood flow. Strenuous physical exercise appears to reduce blood flow to the tract and may reduce absorption rate. A variety of factors may affect the rate or extent of absorption. Interactions in absorption are mediated by physical-chemical, physiological, or biochemical factors. Physical-chemical considerations include the characteristics of the dosage form and altered solubility, dissolution, and chemical stability within the GIT. Physiological factors include residence time in the tract (i.e., gastric-emptying and intestinal transit rates) and blood flow to the absorbing membrane as well as its characteristics. Biochemical factors would include enzymatic activity in the GIT. Drug-food and drug-drug interactions may alter absorption by one or more of the foregoing mechanisms.